Elevation Change: 3200' descent from Glacier Point to Happy Isles with 700' ascent along Panorama Cliff. To drive to Glacier Point, take the long and winding Wawona Road (a.k.a. Route 41 that connects Yosemite Valley with the South Entrance). The junction with the Glacier Point Road is roughly 17 miles from the South Entrance and 9 miles from the junction with Southside Drive in Yosemite Valley. Take Glacier Point Road roughly 16 miles to the parking lot at the end. This is Glacier Point! (The National Geographic Trails Illustrated Map for Yosemite is very useful to get a feel for the roads and junctions.) 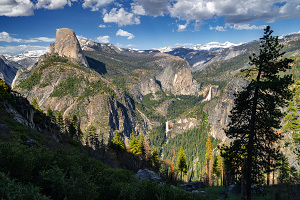 Alternatively, there is a Glacier Point Bus Tour from Yosemite Valley to Glacier Point; this option is especially useful if you want to do a through-hike along one of the many trails that starts at Glacier Point, including Panorama Trail! From the Glacier Point parking lot, follow the large walkway for a few moments and look for the large trailhead sign for the Panorama Trail and the Pohono Trail on the right. After splitting off from the Pohono Trail, the Panorama Trail heads due south away from Glacier Point, making a steady descent down the eastern slope of Illilouette Ridge. 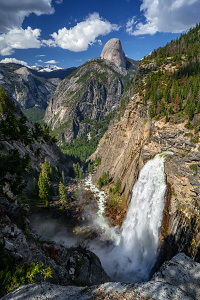 Along the trail here, you can get a great view of Half Dome's profile with Vernal Fall and Nevada Fall behind it to the south. The trail zigzags all the way down to Illilouette Creek at the top of Illilouette Fall, another one of Yosemite's powerful spring waterfalls. A little spur trail offers a pretty good view of the waterfall, but take great care as there is no railing and the rock is crumbly and outward-facing. After crossing the hiker's bridge over the creek, the trail then heads northeast and starts its ascent to the top of Panorama Cliff. Roughly one mile of hiking from the Illilouette Creek crossing, look for a short spur trail that heads north to Panorama Point, a spot at the edge of the cliff that offers vertigo-inducing views down into Yosemite Valley with the sheer 200-ft tall sloping face of Panorama Cliff to the east. WARNING: Panorama Point used to be an official viewpoint, but the trail was routed away from it due to the instability of the area. Take great care if you explore here and do not get close to the loose outward sloping edges. There are no safety railings here to protect you. Continuing east on the main Panorama Trail, as we turn the corner we now get wonderful unhindered views above Nevada Fall with Liberty Cap standing proudly behind and the backside of Half Dome looming in the distance. Several switchbacks bring us down to the junction with the John Muir Trail. Before heading down to the bottom of Yosemite Valley, pay a visit to the top of Nevada Fall. 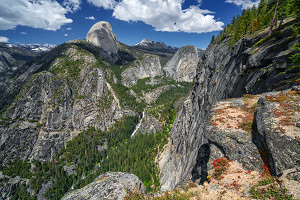 The view from the top of the hiker's bridge and the Nevada Fall lookout are especially impressive during spring runoff. From this point, you could take the Mist Trail down to Yosemite Valley, but the John Muir Trail is probably more aesthetically pleasing and safer for the descent. The hike ends at the Happy Isles Trailhead where you can pick up the Yosemite Valley shuttle bus or walk the road to your next destination. While the best and easiest way to hike the Panorama Trail is from Glacier Point down to Happy Isles, you could also do a shorter hike from Glacier Point to Illilouette Fall or Panorama Point and back up again. Keep in mind that the return hike is all uphill at a relatively high elevation, so you may be gassed by the end of the hike. The Panorama Trail is definitely a Yosemite classic and the views from Panorama Point and the top of Panorama Cliff are some of the best in the park. If you're able to score a ride on the Glacier Point Bus Tour, it makes the logistics of a through hike much easier.